I have wanted a peach tree in my garden for a long time but on my allotment it is impossible to have as the winds are often gale force and they are coupled with sea spray. Last year we all got ‘hit’ by the conditions and nobody had any fruit with the exception of my cherry tree which just so happened to set early. On a trip to Wisley I noticed that they had a small greenhouse with a peach tree in a container and on wheels. Pinned to the door they told the reader the methods and practices for keeping a peach tree. I read this with great interest and I remarked to myself that I had a similar patio container pot and I could get a peach tree from my catalogue. The first year was very successful and I was very pleased with the results. 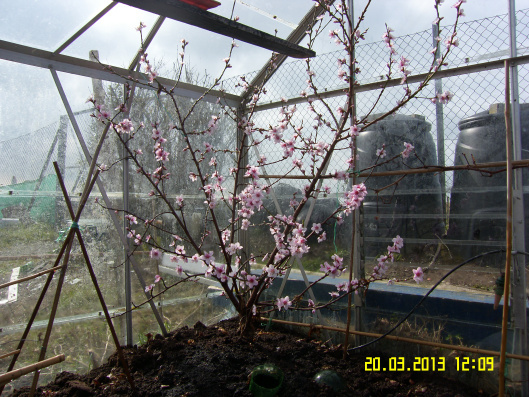 I followed all the guidelines laid down by Wisley and it was a great success…..I had got my peach tree. The second year was more of a challenge. As the tree began to bear more fruit, it was nigh on impossible to stick to the guidelines laid down by Wisley as I had to construct a matrix of strings and supports and secure them to the roof of the greenhouse to hold up the boughs and limbs of the tree. But nonetheless I was still very pleased and I was able to give a lot of the fruit away, as I had so much. The third year was even more of a challenge as now the tree was pot bound. I decided, going outside was not an option. It had to planted within the greenhouse. I chose a spot, dug a hole and buried it with a sack full of broad leaf leaves and my own compost. I got a good crop but the the tree was not covered with blossom. There were clear ‘holes’ in its development and the yield was about similar to the previous year. There were signs of success…So, encouraging. The fourth year…This year…..The peach has gone way over the top. It is like a pink carpet. I have never seen so much blossom! Even in all the cold weather and sub zero temperatures it seems to have not been effected. As for pollination? I have employed lots of patience and my index finger….Tapping each blossom with the chant ‘ You are a peach and you are another’. The pictures show the tree on the 20th March and today, the 10th April it is even fuller and pinker with the blossom just about to drop. 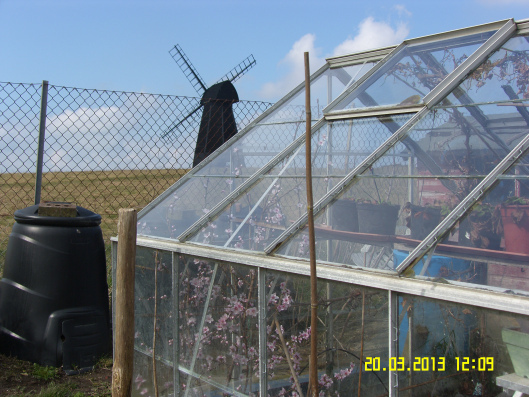 So, in the left hand corner of my greenhouse I have a peach tree and in the right hand corner I have a black hamburg grape, which is designed to add an extra buttress to the greenhouse against the westerly winds as it grows and fills out. The roots of the grape are outside the greenhouse and the grape grows through a broken pane of glass at the base of the greenhouse. I shall prune the peach to behave in the same way as it grows. Both are now permanent fixed assets and will remain inside. My greenhouse is not heated and I didn’t cover the peach tree with any newspaper or fleece in the off season. Feeding? I will follow the guidelines laid down in the RHS Garden Magazine which is Tomorite for fruit. I hope my little tale amuses you. I for one did not expect so much success from such a small tree.